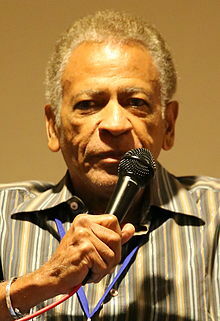 Austin Stoker (born October 7, 1943) is a Trinidadian-American actor known for his role as Lt. Ethan Bishop, the police officer in charge of the besieged Precinct 9, Division 13, in John Carpenter's Howard Hawks-inspired, 1976 film, Assault on Precinct 13. This was one of the few heroic starring roles for an African-American actor in an action film of the 1970s outside of the blaxploitation genre. Stoker was born in Port of Spain, Trinidad and Tobago. Prior to his role as Lt. Bishop, Stoker appeared in several blaxploitation films, often playing police detectives. Among these films were Abby (1974), Combat Cops (1974), and Sheba, Baby (1975), in which he played Pam Grier's love interest. Some of Stoker's other notable acting roles were in Battle for the Planet of the Apes (1973), Horror High (1974), Airport 1975 (1974), Victory at Entebbe (1976), and the 1977 television mini-series Roots. Stoker is known to Mystery Science Theater 3000 fans for his role as Dr. Ken Melrose in the 1982 B-movie, Time Walker, in which he appeared with Darwin Joston, his co-star from Assault on Precinct 13. Airport 1975 (1974) as Air Force Sgt. ^ "Stoker, Austin". The Caribbean Memory Project. Retrieved December 12, 2016. ^ "Enid Mosier (alt. Vivian Bonnell)". The Caribbean Memory Project. Retrieved December 12, 2016. This article about a United States film actor or actress born in the 1940s is a stub. You can help Wikipedia by expanding it.